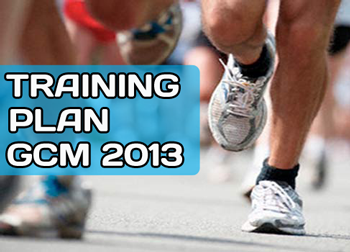 Here is the current version (updates can be made) of our Training Plan to Gold Coast Marathon. You can either read it below or view the full colour version as a PDF which you can download. Remember to read all the explanatory notes before delving into the schedule. To download hit the button below or read further. Interval Session – designed to increase speed, lactate threshold and cardiovascular capacity. Intervals are designed race specific – according the race that runners are preparing for. Hill Repeats – for improving VO2max and increasing muscle strength. LSD – long slow distance (on weekends). Prepares your body for consistent output over long periods of time. Race specific distances. It is critical that you have a day of rest each week. Rest is training. No rest is injury – eventually. This training program is a guide only and does not constitute authoritative advice or prescription on training matters. No warranty of safety should result from its use. The guide in no way guarantees against injury or death. You need to see your doctor for advice on your capacity to undertake strenuous training. This is not the only training plan on earth that works, training plans although built on sound principles are subjective. This is a general guide to what has helped us as a club take plenty of people from the couch to the marathon finishing line. This program assumes that the Gold Coast Marathon is the peak race that you are building up to. My advice is NOT to do every race on the calendar, but to pick and choose your races according to which will help prepare you best for your chosen peak race of the year. It is however very important to at least race a 5km or 10km in the run up to Gold Coast so that you have an indicative time from which your race pace can be calculated. Shorter races are essentially time trials, and you need to have them built into the program. (I don’t let runners know at Striders when we are having a TT because them they don’t show!). Park Run is held every weekend and is a good option for a TT, although it messes with your training schedule. It is better to do a shorter time trial (3-5km) during the week and keep your training program on track, or do your TT on Saturday and your long run on Sunday at a slower pace. (make sure you get a rest day for the one you lose). Training weeks are in GREEN. Race weeks are in YELLOW. Explanatory notes above the week. Peak Training builds up relevant to the race that we are preparing for. Tapering happens over a 3 week period where we taper down after Peak Training period which is strenuous. Tapering allows recovery and arrival at race with fresh legs. I prefer 10km runners to train past 10km (up to 16km) so that on race day you have more than enough endurance built in and you don’t need to worry about that. You can concentrate on putting out maximum effort and the race will seem short. I prefer Half marathoners to train past 21km (up to 26km) so that on race day you have more than enough endurance built in and you don’t need to worry about that. You can concentrate on putting out maximum effort and the race will seem short. I prefer marathoners to train to a maximum of 35km preferably 33km. It’s no use being a hero and going further because you will do damage to your legs and as a result you will not be able to train as well in the run up. You race when you race (damage yourself) but train when you train (build not damage). You put your biggest effort into your two weekly technical sessions (intervals & hills) so don’t kill yourself in LSD. Time on legs is most important rather than speed or distance. Obviously you need to achieve your distances in the run up to a marathon but be careful. The distances are indicative. We try and make our interval sessions interesting and creative, these distances are simply what the interval session is based around in terms of what runners need to achieve in their intervals. If you are doing this by yourself then you simply do the straight distances as shown. All normal interval sessions are based around 5km. Taper intervals are based on 4km.